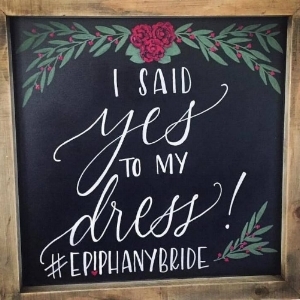 An Epiphany Bridal Boutique exclusive! All gowns purchased at our boutique have the additional perk of our Custom Service Packages. Choose the one that works best for you - they will all save you money, time and stress! Packages may be purchased at the same time as your gown or you may choose your package when your gown arrives and you know more about what level of details work for you. when your gown needs just the basics, no fuss, no muss. GOWN STORAGE we will store your gown until the date of your wedding. no worries on where to keep it or risk damage from pets and guests in your home. alterations and fittings, custom veil and so much more! this is the package for the bride who wants and needs the full experience at the absolute best value! FULL BODICE THRU HEM FITTING AND ALTERATIONS whether your gown needs just a bit of taking in or letting out to make it just right or if your wedding workout worked just a bit too well and your gown is now too big, we will fit and shape your gown to absolute perfection! HEM any type of hem and skirt, we'll alter it to your perfect length. includes all laces and beading, horsehair finishes, etc. offered on ALL Epiphany gowns. ACCESSORIES 30% off all bridal accessories, including earrings, necklaces, headpiece and hair accessories. treat yourself to a little something extra. taking design to another level, this is for the bride who wants it all and more! Embellished veils, design changes, accessory discounts, shopping incentives and more! DESIGN CHANGE AND OPTIONS when you want the dress to be all about you! if it's possible - we'll make it happen. design options include neckline reshaping, lowering backs, adding extra fullness to skirts or reducing fullness, application of more lace, beading, buttons and trims (*material charges are extra and separate from this package*), changing straps and sleeve options - share your vision and let us create it. SHORTENING TRAIN AND/OR TRAIN LINING maybe it's just a tad too long for you - let's fix that. CUSTOM BRIDAL VEIL lace trim, rhinestone, sparkle... what's your vision? our ultimate custom bridal veil designed to create the perfect finishing touch to your gown. we hand select laces and trims. each veil is designed and hand created. no other bride will ever have your veil. SHOPPING DISCOUNTS 45% discount on all bridal accessories, including jewelry, headpieces, hair accessories, belts and sashes. $100 gift certificate toward any future purchases at epiphany (not applicable to gown, lace/trims and wedding accessories). may be used for rehearsal dinner dresses, resort wear, cocktail or anything else in the store. any unused portion is not redeemable for cash, so use it all and treat yourself!